Did you know that the Roman Catholic Church believes that their Catholic Mass will SATISFY the justice of God, for sins committed against him? Did you know that if you disagree with that teaching on the Mass, and the Transubstantiation of their Catholic Eucharist, then you are under one of the curses of the church of Rome! The Roman Catholic church has not changed at all. They still hold fast to the teachings of the Council of Trent which contain over 100 anathemas (curses) against people who do not believe their false teachings! The Roman Catholic Cardinal Timothy Dolan, of New York’s famous St Patricks Cathedral, defended the Council of Trent on his RADIO PODCAST of April 30, 2015. Most people do not know that the council of Vatican II also defended the Council of Trent, with all of it’s curses! It would be rather humorous if they started reading off all of those curses, one by one, at the next UNITY meeting with the cultish system of Rome! In our modern day we have major “Christian” leaders joining hands with people such as Cardinal Dolan as if they were all brothers and sisters in Jesus Christ! Pastor A.R. Bernard of the huge Christian Cultural Center in Brooklyn N.Y, preached at Cardinal Dolan’s St Patricks Cathedral on the subject of Christian Unity! Folks it is getting scary out there! Pastor A.R. Bernard is also the President of the Council of Churches in NYC. There is a huge elephant in the room, decked out in Roman Catholic vestments, and few will preach against it. The apostasy that was prophesied in the Bible by the Jewish apostle Paul, is happening right before our very eyes! Many of the so called “Christian” leaders would not be able to give you a straight answer, even if you were to tape a ruler to their tongue. Why? Because they have allowed themselves to be deceived, and bewitched by the “doctrines of devils” (1 Timothy 4:1) which Paul warned us about. The “Christian” pastors and leaders have been TRAINED by the DEVIL without even realizing it. They are in a demonic trance, and they have led multitudes of Christians down a dark and evil path, for which they will give an account one day. It is most unfortunate that many Christians have been bamboozled by such leaders, because they have trusted them with everything. The only way out for those Christians is to truly study the word of God for themselves like the people of Berea did, (Acts 17:11) and to pray to the Lord for direction. I recently watched a VIDEO where well known Pastor, and author Rick Warren, referred to the Roman Catholic Pope Francis as “our Pope” which is simply incredible. If Pope Francis is the Pope to Rick Warren, then that would make Rick Warren a Roman Catholic would it not? If Rick Warren is promoting the Pope and his false doctrines can the man be truly SAVED? Leaders such as Rick Warren, James Robison, Billy Graham, Franklin Graham and tons of others are working with the same church of Rome that the TRUE Christian martyrs stood against! In other words, the Roman Catholic church is still teaching the very same doctrines regarding the Mass, Purgatory, the Papacy, infant baptism, the seven sacraments as they did back then! You can read about the thousands of incredible tortures, and murders, by the church of Rome against Christians, in Foxe’s Book of Martyrs. Folks it is downright scary that so few Pastors ever mention this in the modern day church! You do not have to dig deep to find that the Roman Catholic church preaches a FALSE gospel. It does not matter what you have been told concerning the Roman Catholic church by so called “Christian” leaders. The only thing that matters is whether the Roman Catholic church is preaching the soul saving gospel which is found in the scriptures. When you search the scriptures, you will NOT find anything that remotely resembles their “sacrifice of the Mass” for the living and the dead. I speak as a former Roman Catholic who was saved out of that FALSE and DEMONIC system, and I implore you to ignore he call for “unity” that comes forth from Rome, and other “popish” ministries which disguise themselves as Christians. When you or your church comes into unity with a church which preaches a false gospel, and other “doctrines of devils” you are falling right into the demonic headlock of the Devil himself. You are responsible to know these things for yourself. Keep that in mind as you read the rest of this article, and PRAY for the Lord Jesus Christ to open your spiritual eyes, through the POWER of the Holy Spirit. Does the Roman Catholic Mass satisfy the justice of God, or did Jesus Christ satisfy the justice of God on the cross? Read this article and be AMAZED at the audacity of the Roman Catholic Church to teach what they do, concerning their Catholic Mass! 1] The Mass is unbiblical. 2] The Mass is a false doctrine propagated by a false church. 3] Many Evangelical Christian “leaders” have promoted unity with Roman Catholicism (thereby endorsing their false gospel, Galatians 1:8,9). The Bible warns us about seducing spirits and doctrines of devils. The Roman Catholic Mass is CLEARLY a DOCTRINE of DEVILS. The Bible tells us that we, as Christians, should contend for the faith. 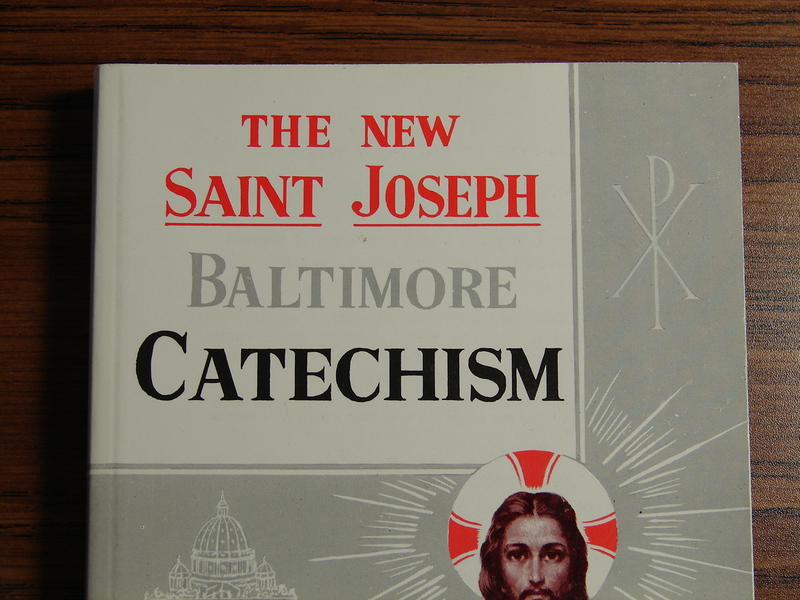 Here I will use Roman Catholic teaching from the New Saint Joseph Catechism, that bears the RC Imprimatur, which signifies that the doctrine within the Catechism has been approved by the Roman Catholic Church. 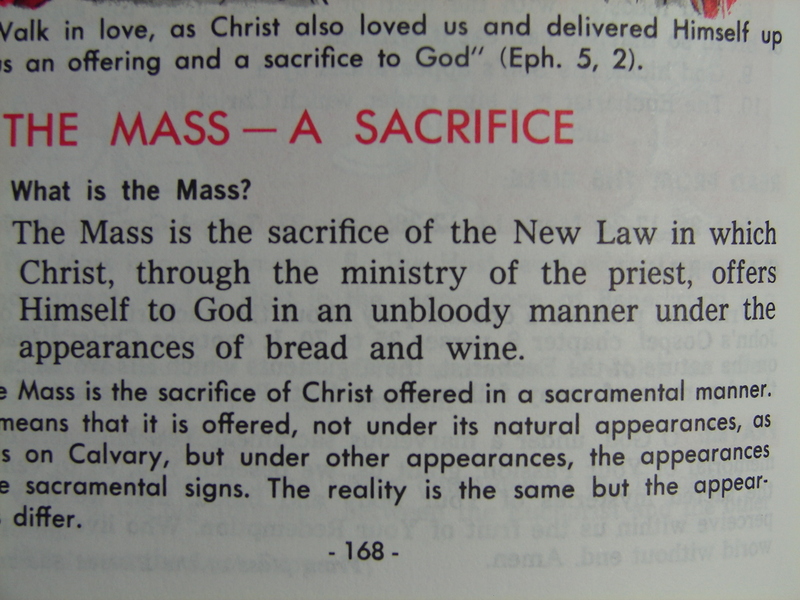 As you can see, the Mass is referred to as a SACRIFICE, in which CHRIST offers Himself to God, in an UNBLOODY MANNER. Folks, that is absolute heresy. The Bible makes it clear that it is the BLOOD that makes an atonement for the soul! Right before Jesus died and gave His last breath He cried out ” . . . IT IS FINISHED . . .” [John 19:30] The perfect sacrifice has been perfectly FINISHED, and it need NOT be OFFERED up on a daily basis on the ALTARS of Roman Catholic Churches throughout the world! 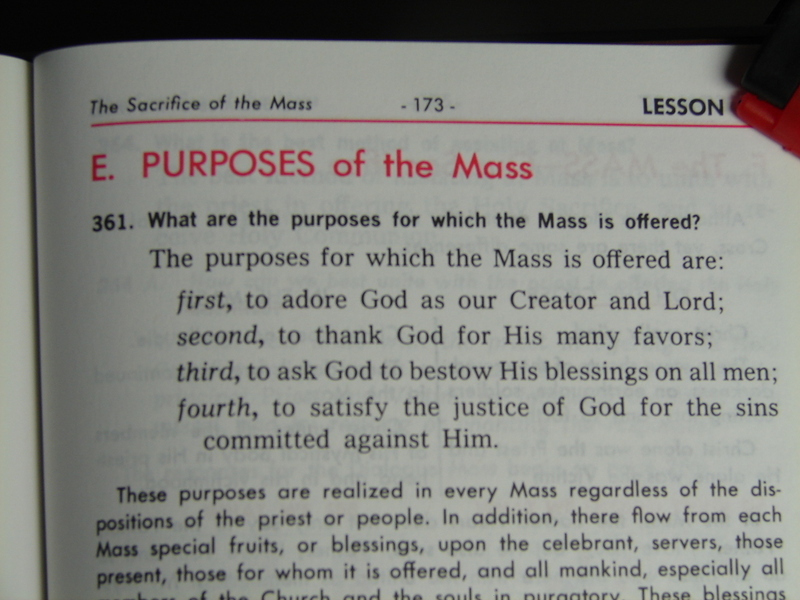 If you take a look at the FOURTH ITEM on the list, you will see that one of the PURPOSES of the Mass is to SATISFY the justice of God, for the SINS committed against HIM. That is why you will find the Roman Catholic Mass being said every day, without fail, in Catholic churches throughout the world. Every single day they are teaching people that their Roman Catholic Priest is satisfying the justice of God, for THEIR sins, while they should be telling people that Jesus Christ PAID the price in FULL already! I hope that you understand that the Roman Catholic church is teaching pure HERESY. The Bible tells us that the justice of God was satisfied when Jesus Christ died on the cross, almost two thousand years ago. The Bible lets each and every SINNER (myself included) and every other person in the world know that they can be JUSTIFIED by the BLOOD that Jesus Christ shed for them! The greatest NEWS in the world is that CHRIST died for the UNGODLY, and the motive behind the DEATH of the Son of God was GOD’S PURE UNADULTERATED LOVE TOWARD MANKIND! Any person in the world, no matter what color, race, male, female, rich or poor has the opportunity to receive SALVATION through Jesus Christ, and be JUSTIFIED by His BLOOD, before God. Why? Because every single one of us fits very comfortably into the category of UNGODLY! My Bible tells me that I have been RECONCILED back to God already, through FAITH in Jesus Christ, and I have NO NEED for a Roman Catholic Mass to be offered for me. 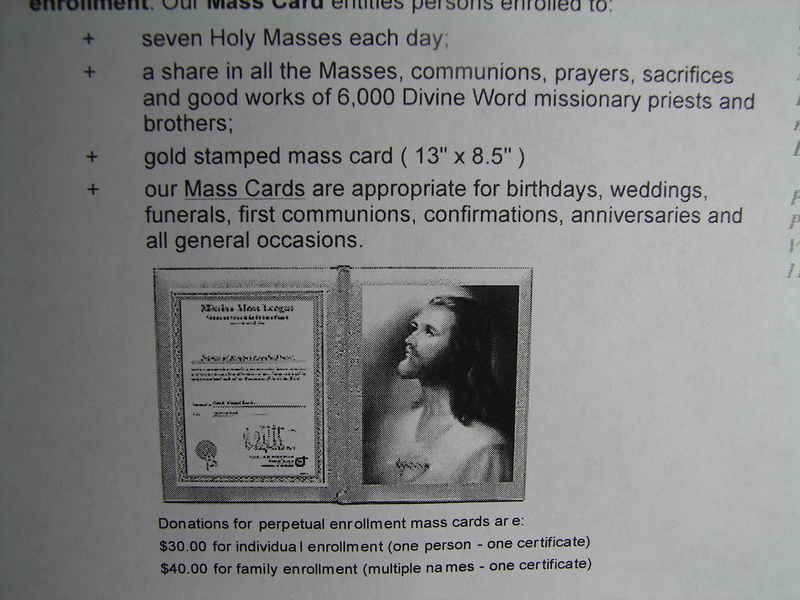 Mass cards can be obtained, for a donation, to have a Catholic Mass offered for a person living or DEAD! 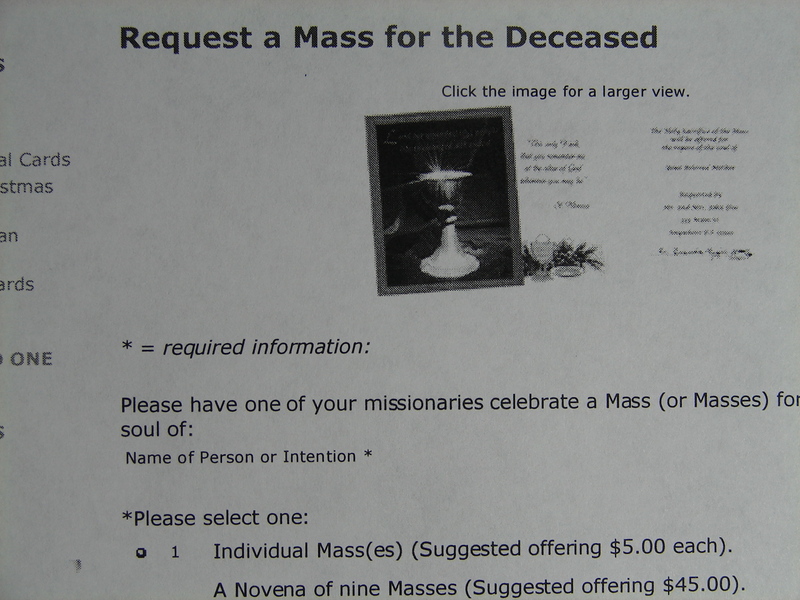 In the illustration above, you can see that a donation of $5 will allow a person to have one Catholic Mass offered for them, and a donation of $45 will allow nine separate Masses to be offered for the DECEASED (DEAD) person. The purpose of the Catholic Mass for the DEAD person is for the repose (rest) of their soul. The Catholic Church teaches about a place called Purgatory, a place where the soul will remain for an undetermined amount of time before they go to Heaven. The Mass card is for their benefit, and it can shorten their time in Purgatory! Folks, there is no such place called Purgatory, and there is NO MENTION of it in the scriptures (Bible)! Jesus Christ preached about HEAVEN and HELL, and he said that a person was either SAVED or DAMNED, with no mention of Purgatory at all! In the illustration below, you can see that a person can have seven Catholic Masses offered up for them every single day, and they can also share in the “good works” of others. The Bible tells us that salvation cannot be earned by “good works” lest any man boast. That is why I speak out against the doctrines of the Roman Catholic Church.